Super Salon Cape! Largest Cape on the Market! This Super Salon cape is one of our best seller with high end salons and stylists, that never wants color or anything getting on there client. Top of the line, The best on the market! Great for Cutting, Color, Bleaching and Shampoo! Wide variety of fabrics and colors! All fabrics do not soak through and all the fabric colors are color and bleach proof except White and Chrome, they are just resistant. *55% Polyester and 45% Nylon Wonderful Iridescent Fabric, Long Lasting! *Durable 100% Nylon Oxford cloth or basic standard what we started with. It fits clients of all ages with a generous 24 inch neck. 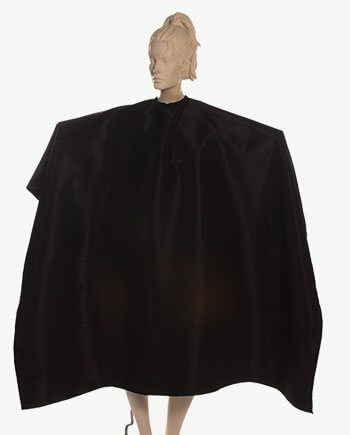 This super size cape with a long back and front has 6 snap closure for a comfortable fit, most all the fabrics are treated to be resistant to color and bleach. Many Colors and Fabric types, just scroll down. Nice Quality Good Length Comfortable Material Guys go for this , its awesome! It is simply awesome cape, I loved it! This a wow product for me. The product is as it is shown in the image. Last week I purchased the black color super cape, the best thing I liked about it is easy to wash and can be used for many purpose.